Dublin City Council decided to redevelop the Rathmines site to provide a range of quality sports and community facilities. Dublin City Council decided to redevelop the site to provide a range of quality sports and community facilities. To subsidize the cost of the facilities, a range of residential apartments was included in the redevelopment to be sold on the open market on completion. Donnelly Turpin Architect's won an invited competition to complete the design. As part of the winning design Donnelly Turpin Architects devised an urban design strategy as a template for both this project and adjoining sites. 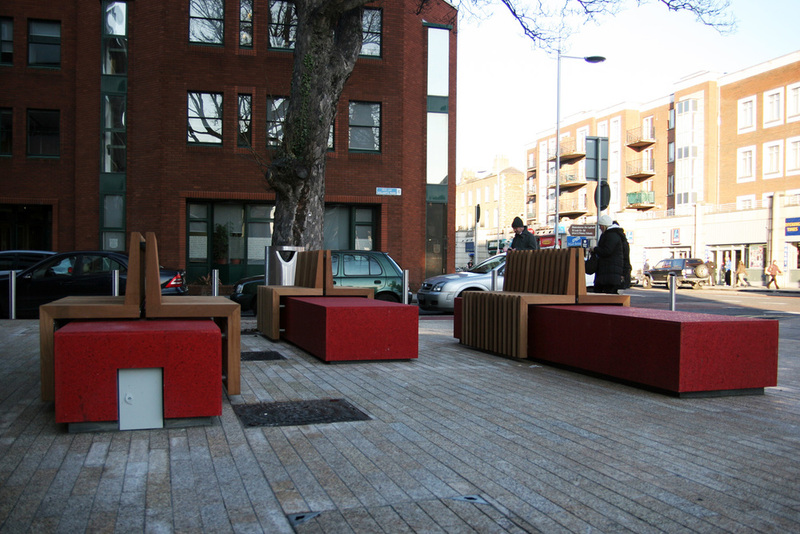 This envisaged the phased development of two new public spaces: the first a linear hard-paved public plaza fronting Rathmines Road and the second, in contrast, a park to the rear facing the Georgian terrace of Williams Park. The benches are clustered under an existing tree facing south over the new plaza to create a seated community gathering area. 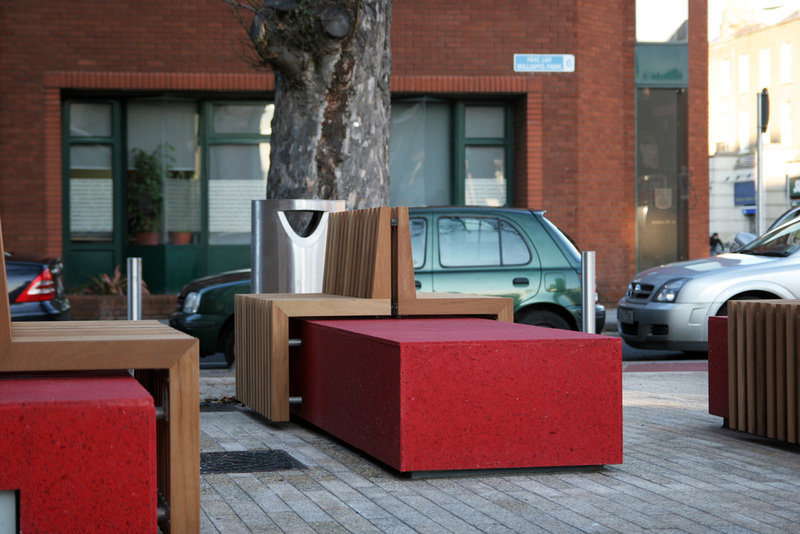 Their dramatic red appearance is intended to contrast the granite paving generally, whilst complimenting the red brick and adjacent red tarmac. The base is clad in fully recycled glass resin and is U.V. resistant, designed to be maintenance free and fully durable. 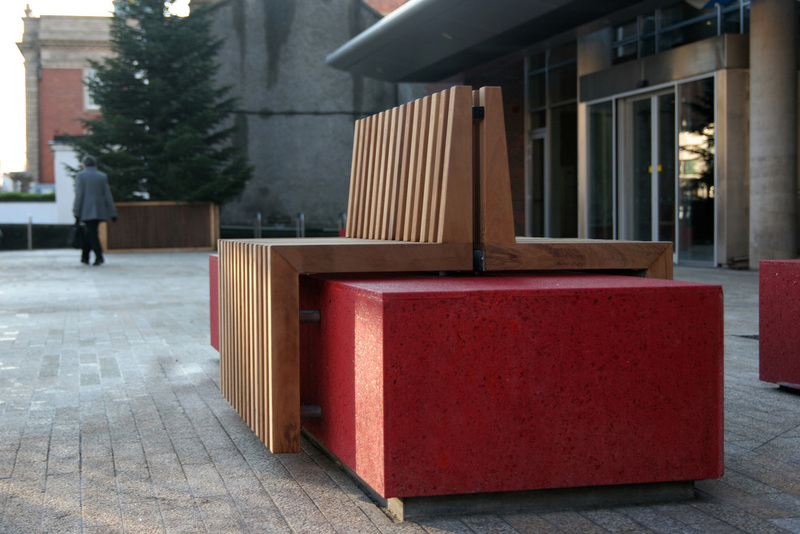 The backrests, part of the design brief for the bench are untreated Iroko, readily replaceable if required and again designed to be maintenance free. The direction of the slats and the arrangement of the backrests themselves are designed to discourage skateboarding. Donnelly Turpin Architects engaged Omos given their track record in delivering bespoke external furniture. Whilst the need for durable and robust details fixings was paramount, it was critical that this would not dilute the simple design envisaged. Similarly, it was important to the Architect's design that whilst high quality machined precision was required as part of the fabrication process, it should not dominate the 'crafted' appearance of the 2 simple elements; the base and the backrests, and how they fit together. It was in this particular regard that Omos were able to offer carefully crafted bespoke technical solutions.